Bobby Ryan has the distinction of being the player taken after Sidney Crosby in the 2005 Entry Draft. As expected, Crosby jumped right onto the scene that year; Ryan’s development has taken a bit longer. Drew Doughty has the distinction of being the player taken after Steven Stamkos in the 2008 Entry Draft. Stamkos is expected to make a big splash with Tampa Bay this season, but Doughty will get a chance to do the same in Los Angeles. Patrik Berglund, St. Louis Blues – Berglund, a first-round pick in 2006, has made his way from Sweden to North America and is primed to take over as the Blues’ second-line center behind Andy McDonald. It’s possible Berglund centers a line with fellow rookie T.J. Oshie and David Perron, who is 20 years old and entering his second NHL season. Berglund was one of the top players at the World Junior Championship last winter. He’s a supremely gifted playmaker and should give the Blues’ second line a chance to score some goals. Derick Brassard, Columbus Blue Jackets – Like Berglund, the Blue Jackets are hoping Brassard shows enough in training camp to earn the second-line center position behind R.J. Umberger. It’s also possible Brassard develops into a top-line center if Umberger proves he’s better suited on the wing. That may be a stretch now, especially because the Jackets are banking on Umberger working out in that position, with Rick Nash and Kristian Huselius as the wings. Brassard had 51 points in 42 games with Syracuse of the American Hockey League, but only two points in 17 games with Columbus last season. Brassard has to prove he can play at a high level in the NHL before the Jackets give him any more responsibilities. Drew Doughty, Los Angeles Kings – Doughty, the No. 2 pick in June’s Entry Draft, has the ingredients to be one of the most poised and skilled big defensemen in the NHL. The Kings dealt Lubomir Visnovsky to Edmonton this summer and Rob Blake left for San Jose, creating room for Doughty to not only make the team, but play a significant role. Doughty, 18, is 6-foot and 219 pounds. He had 13 goals and 37 assists for Guelph of the Ontario Hockey League last season. Thomas Hickey and Colton Teubert also will be vying for spots on the Kings’ blue line, but Doughty is the top prospect now. Jonathan Ericsson, Detroit Red Wings – If you figure Nicklas Lidstrom, Brian Rafalski, Niklas Kronwall, Brad Stuart and Andreas Lilja are locks in Detroit, that means Ericsson will have to beat out Brett Lebda, Derek Meech and Kyle Quincey to play in the top six. Ericsson, a forward turned defenseman, may be ready to do that, but don’t be shocked if he starts the year in Grand Rapids of the AHL and works his way into the Red Wings’ rotation if he shows up strong there. He looked comfortable in his eight NHL games last season, but the depth in Detroit will make it tougher for Ericsson to make an immediate splash. Whether it’s immediate or not, Ericsson could become an impact defenseman for the Wings. Nikita Filatov, Columbus Blue Jackets – The proper paperwork is in order and Filatov will be with the Blue Jackets for training camp. The No. 6 pick in June’s draft has a real shot to make the club as a top-six forward, likely at wing, with the thought he may one day move to center. Filatov is a dynamic offensive player. He had nine points in seven games at the World Junior Championship last year and 66 points in 34 games in the Russian junior league. It’ll be interesting to see how he adapts to the NHL game. Colton Gillies scored 24 goals for the Saskatoon Blades of the Western Hockey League last season. Colton Gillies, Minnesota Wild – Gillies is 6-foot-4 with the ability to score a lot of points, but he plays a strong all-round game and that should impress coach Jacques Lemaire when he assesses him during training camp and tries to determine if he’s NHL-ready. Gillies scored 24 goals for the Saskatoon Blades of the Western Hockey League last season and then made the jump to the Houston Aeros, the Wild’s AHL affiliate, where he had a goal and 7 assists in 11 games. In Lemaire’s system he could flourish in a third- or fourth-line role to start. Patric Hornqvist, Nashville Predators – Nashville coach Barry Trotz has said Hornqvist should make the team out of training camp as a top-six forward. While it may not happen this season, Trotz believes Hornqvist has the potential to score 30 goals. He had six at the World Championship this past spring. If Hornqvist makes a splash it would be a major coup for the Predators, who waited to nab him in the seventh round of the 2005 Entry Draft. Hornqvist is 21 years old now and ready to make that splash after a strong career in the Swedish Elite League. Ryan Jones, Nashville Predators – Jones may be the biggest surprise rookie in the League this season given the fact that he was an undrafted college player who already has been traded once in his career. The Predators think so highly of him they traded Marek Zidlicky, their top offensive defenseman from last season, to Minnesota in a one-for-one deal. Trotz thinks Jones can play his way into a role on one of the top two lines this season. He played four years at Miami (Ohio), wracking up 147 points in 161 games. T.J. Oshie, St. Louis Blues – While Berglund may be the supreme playmaker, Oshie is the gritty attack dog, which is why you may see them on the ice together this season with Oshie, a natural center, playing on the wing. 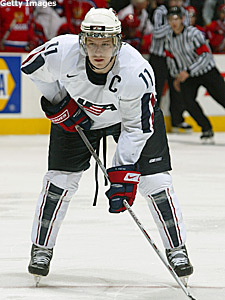 Oshie, the Blues’ top pick in 2005, played the last three seasons at the University of North Dakota. After scoring 45 points in 42 games last season – giving him 142 points in 128 college games – he signed his entry-level contract with the Blues this summer and is ready to compete for a roster spot, which is his to lose. Kevin Porter won college hockey’s top prize last season by scoring 63 points in 43 games. Kevin Porter, Phoenix Coyotes – After a stellar four-year career at the University of Michigan, Porter had four assists in seven AHL playoff games with the San Antonio Rampage. The Coyotes feel he is ready to make the big club this fall. Porter, though, has to avoid the Hobey Baker hangover. He won college hockey’s top prize last season by scoring 63 points in 43 games. However, Ryan Miller (2001) is the only Hobey Baker winner this decade that has made a big splash in the NHL. Matt Carle, who won it in 2006, may do so this year. Ted Purcell, Los Angeles Kings – The undrafted 22-year-old is looking to fill a role as a forward on one of the top two lines in Los Angeles after leading the AHL with 83 points in 67 games last season, his first as a professional after playing one season at the University of Maine. Purcell played 10 games with the Kings last year and handled his time well, contributing a goal and two assists. He’s 6-foot-3 and 195 pounds, so he’s a power forward with room to grow, but he may do it while playing in the NHL. Bobby Ryan, Anaheim Ducks – Ryan would love it if people started thinking of him as one of the main contributors to a Stanley Cup contender, rather than the player picked after Crosby. At 6-foot-1 and 220 pounds, Ryan has the build and offensive touch to become an elite power forward, but he first has to prove it. After watching him total 10 points in 23 games last season, the Ducks expect Ryan to play in their top six this season, likely on a wing with newly acquired veteran center Brendan Morrison. Jack Skille, Chicago Blackhawks – Last season the Blackhawks were bolstered by the debuts of Patrick Kane and Jonathan Toews. Now that those youngsters are proven players and veteran defenseman Brian Campbell is in the mix, there is a lot less pressure on Skille to become an elite player right away. Skille, though, has the ability to be a productive player for the Blackhawks this season. The seventh pick of the 2005 Entry Draft, Skille had five points in 16 games last season. His speed and strength will make him hard to stop, and he’ll be able to grow into his role this season, which should do wonders for his development. Kyle Turris totaled 35 points in 36 games for the Badgers last season. Kyle Turris, Phoenix Coyotes – Turris is one of the more highly-touted rookies in this season’s class. He comes to the Coyotes after lighting it up for one season at the University of Wisconsin, totaling 35 points in 36 games for the Badgers last season. He played three games with Phoenix once his college season was over. Turris, the third pick of the 2007 Draft, has added 20 pounds since his draft year and is now up to 190. He’s a center, but the pressure on him won’t be as great because Olli Jokinen is ahead of him on the depth chart. Jakub Voracek, Columbus Blue Jackets – Voracek had 56 goals over the past two seasons as a right wing with Halifax of the QMJHL, but his 131 assists in 112 games were something to marvel at. He also had six assists in the World Junior Championship last winter. The Jackets believe Voracek has added enough weight – at least 15 pounds – to take the pounding of an NHL season. Look for him on the second line, and it’s possible coach Ken Hitchcock putting him with Filatov and Brassard. Filatov is a right shot, so he would play on the left wing. Brassard would play center, leaving the left-handed shooting Voracek on the right side. Filatov would have to be a goal scorer because Voracek most is definitely a passer.